Hi Everyone! Welcome back to the Stitch Sisters Podcast and if you’re just finding us now, we hope you enjoy and come back often! A big thank you to everyone who donated prizes and everyone who participated and answered our fun little questions! We had a blast and can’t wait to do something else for Season 6!!! Valerie has been monitoring the mystery CAL with the crochet crowd. She has the pattern for it, but she wants to see how it turns out before she commits to doing one of her own. Katy is still participating in the Behmalong with the Knitmoregirls podcast. 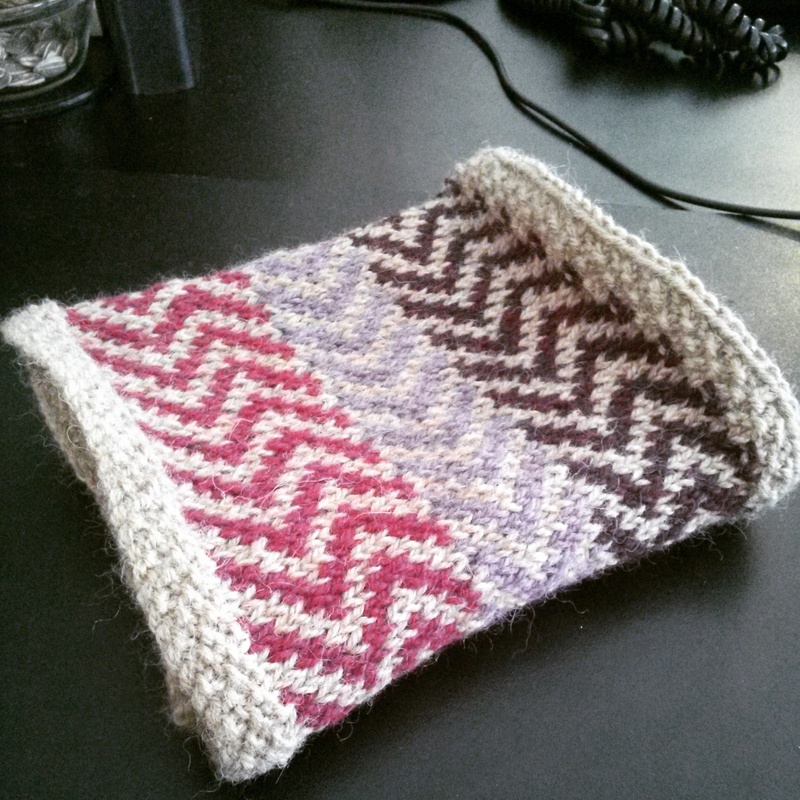 Katy finished a very impromptu cowl gift for the land registrar in her area using leftover Berocco Ultra Alpaca. The pattern is ‘Windbreak’ from Simply Knitting magazine and she modified it by just repeating section 1 instead of doing section 3 of the colourwork. 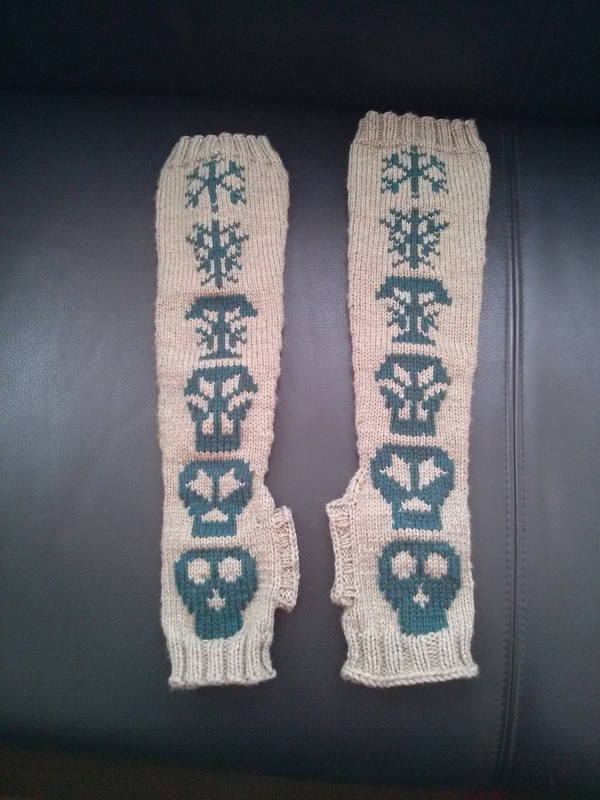 Katy also finished the ‘Snowball’s Chance in Hell’ mitts by the Anticraft!!!! Yay! She slogged through the duplicate stitch and then did some ribbing on the thumb gussets and she was done. She can’t wait to give them to her friend. Valerie has been a bit under the weather so she has been keeping busy with her simple knitted dishcloth with Bernat Handicrafter cotton and working on her crocheted Easy Triangle shawl while recovering. Katy has been working on her Clockwork by Stephen West, her Foolproof Cowl by Louise Zass-Bangham, her two-at-a-time toe up socks using ‘Night @ the Roxbury’ by Must Stash Yarns, and she plans on swatching for a cardigan that she hasn’t decided on yet. Need: Katy needs to decide on a cardigan pattern!! Valerie needs to get over her sore throat that has been going on for almost 2 weeks! Want: Val wants to eat a Cadbury Crème Egg!! Katy wants her skein of Zombody Loves Ewe from Desert Vista Dyeworks, because she got shipping confirmation! Want to do: Katy wants to cast on colourful, springy socks using Hobbit Garden by Blue Moon Fiber Arts. Valerie wants to learn to knit a cardigan for herself. Learned: Katy learned that life is unexpected!! Valerie learned that she drinks too much soda and needs to cut back. You had me at YARN!! Both Val and Katy have been wanting to buy and cast on Susan Claudino’s pretty little bunny pattern; Bon Bon!!! We both think it would be a super gift for Easter, even if you have some lovely soft multi-coloured baby yarn in your stash, it would be really cute! Valerie wants a skein of Fairy Hill by Vivid Yarn Studio on Etsy!! It’s so sparkly and she was actually pondering on making a Bon Bon out of it!!! 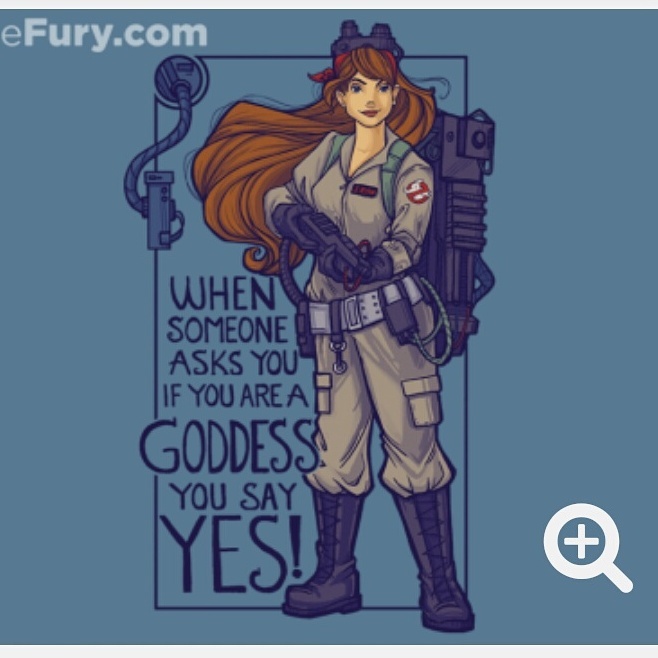 Katy ordered a new t-shirt from Teefury called “I ain’t fraid of no Girls” and it has this awesome pin-up girl Ghostbuster and it says ‘If someone asks you if you are a GODDESS you say YES!’ on it!!! Katy is very excited and thanked Val profusely for tweeting the tshirt update to her. Katy is reading ‘Clockwork Scarab’ by Colleen Gleason and is enjoying it very much. We both got to see Mockingjay Part 1 and we both loved it! Val has watched it a couple times now and even though it is such a bleak, dark series, we love the movies. Valerie watched several new movies, including Maleficent which she thinks is a better story than the original Disney version of Sleeping Beauty. Val has been listening to ‘Running with the Boys’ by Lights, ‘Style’ by Taylor Swift and ‘Love me Like You Do’ by Ellie Goulding. Katy has also been listening to ‘Style’ by Taylor Swift and she loves ‘Up We Go’ by Lights (it’s her 2015 Anthem). Katy’s also been listening to and watching a lot of knitting podcasts, like the Fat Squirrel Speaks, The Sassypants Knitter and The Minerva Turkey Knits podcast.